The importance of physical activity for the health of youngsters is undisputed. And participation in sports clubs and physical education (PE) classes are essential to support this health-enhancing physical activity (HEPA). Therefore, it is important to maintain youngsters in an active sport participation. One main reason for non-participation and drop-out from sports and PE are injuries – specifically knee and ankle injuries contribute to this problem. For example, over 2 million anterior cruciate ligament injuries occur worldwide annually, leading to the longest withdrawal time from sports of youngsters. Only 44% return to pre-injury levels of sports and up to 23% sustain a re-injury; with many of them dropping completely out of sports. This immensely affects the mental well-being and sport participation rates of youngsters, as well as society, in short- and long-term. MOVE HEALTHY: Improving Health and Sustaining Participation of Youngsters in Sports around Europe develops free-of-charge education material to support sport coaches and physical educators to prevent primary lower extremity injuries of youngsters participating in their training. MOVE HEALTHY develops an innovative, ICT based approach based on implicit motor learning. In addition, by providing relative autonomy during the exercises, optimal motor learning is stimulated by enhancing motivation. By the process of co-creation with sport coaches and PE teachers, functional sports exercises will be developed that can be offered and will be integrated in real-world sport training and PE sessions. Effective and fun injury prevention routines will be developed and piloted for football and basketball, and for multi-sports PE classes at primary and secondary levels. The objective is to impact on the motor behavior of the youngsters, and to change the training and attitudinal behaviors of sport coaches and PE teachers. The ultimate goal is that the youngsters can enjoy a lifelong, healthy sport participation. Move Healthy is co-financed by the Erasmus+ Programme of the European Union and is coordinated by the Hanze University of Applied Sciences. 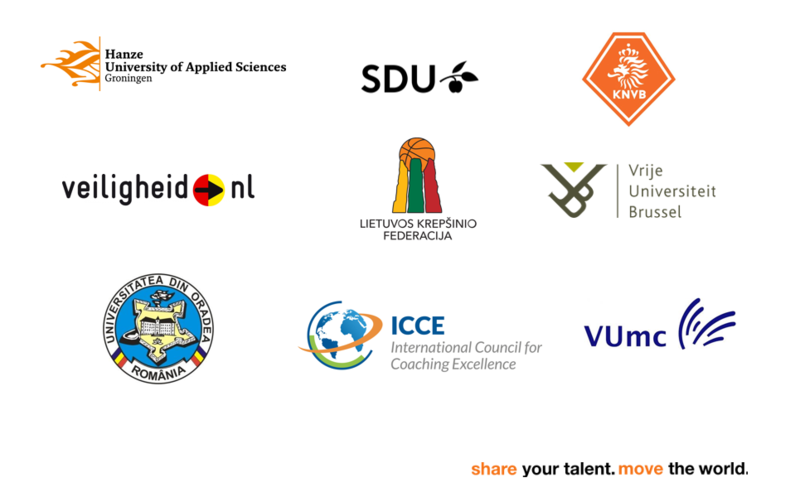 The project consortium also features fellow ENSE members Southern Denmark University, International Council for Coaching Excellence, and the Free University of Brussels, as well as the KNVB, VeiligheidNL, the Lituanian Basketball Federation, the VU University Medical Cente, and the University of Oradea. The project is also further supported by HEPA Europe and ENSE. This entry was posted in News and tagged ENSE, Move Healthy, Projects. Bookmark the permalink.